Spoiler alert we didn't take as much of a beating as everyone else. Build definitely still works I'll try to figure out how to get it to the top. Good luck tomorrow, I won't be playing the league due to work but I'll be testing in Standard this weekend. What was done in the revamp? More Temp-League focused, so no Legacy items. I'll be moving away from using hard to obtain items. This should help and clarify some of the gearing choices for people who aren't necessarily interested in shelling out 60 ex for a Flask or 100+ ex for a Bow. Removal of the Elemental Bow section. Although there are similar concepts, I'm not here to take away from the main message. As a note I've never really liked Windripper that much. Voltaxic/Poison builds have also evolved past the point where I would consider myself comfortable to discuss atm. Removal of Raider variants. Mainly for clarification. You can certainly play this build as a Raider, and I even advocate Raider as a great league starter/budget option. However, for endgame considerations I would like to feature other options. Integration of Budget Version. Had a separate thread, but freed up a lot of space with slimming down the guide. This is my Endgame TS/LA/Barrage Archer. I've been playing since Torment League (Patch 1.3) where I started as a Tornado Shot/Puncture Ranger and I've loved the build ever since. Since then I've put countless hours into Bow Attack builds with various classes and gear sets over Standard and many challenge leagues. It is my favorite character archetype in Path of Exile. I have no claims that this is a must-follow optimal gear/tree configuration, as your style and preferences may differ. Many of the concepts here are slowly becoming general knowledge. Archers gained some amazing offensive weapons in Patch 2.6, although on the defensive front, especially Life Pool, there wasn't a lot of help given. In the current state, CI/ES builds reign supreme with their ability to create a very large EHP pool. I am hoping for some changes and looking forward to Patch 3.0 and/or the beta. Rewarding the juggling of resistances to pay off in a big way, with more Elemental Damage penetration. 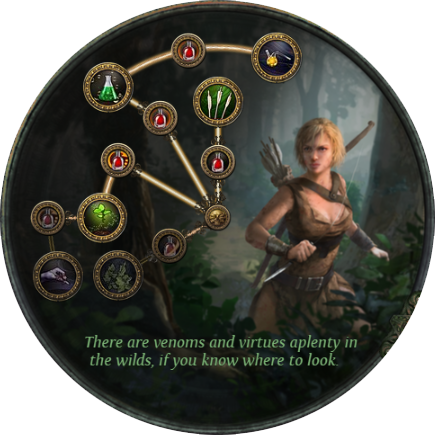 Other major changes to the tree was changing Blood Drinker to "Attack Damage" instead of "Physical Attack Damage," allowing us to not path as awkwardly to the newly changed Duelist Leech area. These changes are reflected in the tree updates. If you do not feel like reading further, my current Gear, Flasks, and Jewels are posted. This section is always being refined. This allows us to take a more in-depth look at this style of character, including what the actual DPS numbers are. 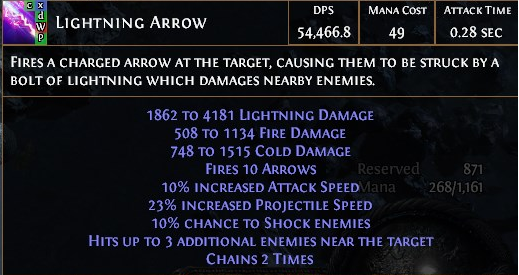 The number of arrows granted in this build through items like a Barrage Helm Enchant, Dying Sun, +1 Quiver, are huge multipliers for our damage that Tooltip DPS in-game does not represent. It is also the primary reason Death's Opus is so underrated, along with its +150% Crit Multiplier. You can tweak the mods in each of the gear pieces, or even input your own items to see what the best upgrades would be for you. Remember to activate in the configurations things like Power Charges, Range = 0 if you are using Chin Sol, and so forth. The following are Gameplay Videos from Patch 2.6. To me, these are the two core things we can focus on to maximize our damage output. Maximizing Critical Strike Chance seems like a no-brainer but from my experience it is the #1 thing that people just ignore. If you take so many passives in a tree for Critical Strike Chance/Critical Strike Multiplier, you are doing yourself a disservice by failing to optimize for it. Do what you have to in order to reach the Critical Strike Chance Cap. 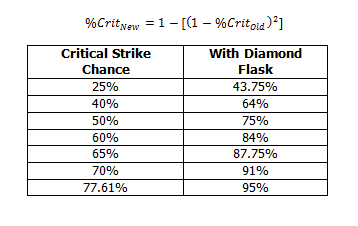 See the spoiler for how your Crit Chance is affected by a Diamond Flask. How to scale damage? It is now moreso becoming common knowledge but in the current state of the game we have excellent opportunities to take Physical Damage, convert it all to Elemental Damage, and scale it hard with Multipliers, especially the WED Gem + Frenzy Charges. That is how we get a large portion of our end-game level of damage. Elemental Damage Penetration from sources such as Boot Enchantments or the Lightning Penetration version of Vessel of Vinktar are also able to augment our damage in ways tooltip DPS does not show. I've not been a fan of being so tooltip focused in the past. However, I seem to get enough requests for Offensive screenshots that I'll include them here. These are taken with the gear, flasks, and charges represented by my current gear. Flasks uptime grants us Resistances, more damage, and more to instantly leech. Convert damage to Lightning, get a massive leech amount from Lightning Damage. The Non-Legacy versions of this Flask may not have full uptime, but the effect is very strong when you do. Having these defenses, as well as Instant Leech at such a ridiculous amount, protects us from Reflect. I don't recommend doing a Reflect Map, but you can survive through any instant where you may encounter Reflect monsters. Several trees are included below. This is tweaked so that if you have a Death's Opus or an 8.70% Crit Base Harbinger, you should be very close to Crit Cap using a Diamond Flask. Well-rounded for all content. Considerable Life Total along with Phase Acrobatics and Arrow Dancing. 5 Jewel Sockets. For Power Charge generation. This allows you to drop Herald of Ice and Curse on Hit/Assassin's Mark for something else like Herald of Ash. What I would consider playing in a temp league. Also, go with this tree if you don't have Atziri's Acuity yet. We get good damage, have access to Vaal Pact, and are protected well with Phase Acrobatics and Arrow Dancing. Still a considerable Life Total along with Phase Acrobatics and Arrow Dancing. We lose a portion of the life total from the Tanky Tree to do a lot more damage. This is closer to what you would expect from a traditional Ranger. Good for all content. Now has access to both WED/Penetration Clusters, and has a very high damage potential. This tree will be very good for boss farming. Great for areas such as Uber Lab farming where Frenzy Charges don't necessarily stick, as an example. A budget gear set for this build can be put together. It can be a very good budget option and/or League starter. While testing this setup, I found Raider to be pretty strong here. You can start as either class, and switch Ascendancy later. Raider has an advantage on a low budget because your only source of Instant Leech is either Vaal Pact or Atziri's Acuity, and Vaal Pact + Blood Rage creates very uncomfortable gameplay. Raider's automatic Frenzy Charge generation bypasses this weakness. As a budget character, consider this a transition phase between upgrades and the ability to reach all end-game content. It's unlikely to take on Guardians or Shaper with this gear, but to help you farm to get there. Just like most bow builds, use your Flasks, attack with your Lightning Arrow or Tornado Shot (Links are both shown in the sample gear) to clear trash, and use Barrage as a strong Single Target skill. Curse on Hit with Assassin's Mark will allow us to keep our Power Charges up. I dislike manual cursing or Frenzy Charge generation (with the skill itself). In the time that it takes you to fire your Frenzy with Curse on Hit and GMP, you could just fire 2 attacks and kill the targets in the same amount of time. The Raider Ascendancy allows us to bypass manual generation of Frenzy charges; with Way of the Poacher, this is free as well, so no need to risk using Blood Rage and having your health dip in between packs. Gearing wise, I found it much more successful to go for Rare, Tri-Resist Gloves/Belt/Boots than seeing most beginning players go for items like Atziri's Step, and so forth. The biggest reason for me is that Jewelry with Flat Physical Damage and WED can provide so much damage for even the poorest of builds, and when you are struggling to cap your resistances, Jewelry options with both DPS mods and Resistances aren't cheap. For leveling, get raw damage and life first, and Crit comes much later on. Gearing requires some stats, so if you follow this rule, we need to prioritize STR/DEX first, and then INT later. So starting in Ranger, moving to Duelist, and finishing off in Shadow is my preferred way to level. since we don't get much value from % Life Nodes early on. Either one is okay. Travel to Aspect of the Eagle early on, and grab Primal Spirit so you can get STR/INT to help with gear and recharge your Quicksilver Flasks more often. Head through to Herbalism, pick up the lower area of the Bow Wheel so you have damage, and finish off with Acrobatics, as it helps greatly early on. at this point you'll need some mana sustain so grab the first leech node in Essence Sap. We move into Shadow for Life Nodes, Life Leech (Blood Drinker), and some Physical Damage Nodes. This is setting us up, as we are around the mid-50's as we start to pick up some Crit Nodes. so it's a good time to start getting Vaal Pact. From here on, you can progress to any of the other trees. When you get Atziri's Acuity, you can connect to Shadow via the right side of the skill tree (saves points). My personal preference for the last things to pick up are Point Blank (when you progress into higher content or commit to boss killing), Frenzy Charges, and Jewel Sockets that take 3 points to travel to. Nice to see you're doing this again. Though the number of people that take the time to read through a resource like this painfully low. For try, for see, and for know. I don't plan on posting more in the "other" thread any time soon really. I will at least say, just by copy + pasting my stuff, the results should be better anyways. I'm also just going to leave the first page as is, maybe make some 2.4 changes. New computer being built now, so at least there will be videos in the future. 1) In drillneck section, you listed a few attributes a rare quiver could have-With the "WED" section, do you mean a quiver with "X-X Added ice,lightning,fire damage"? 2) About what nodes on tree minimum do i need to run Blood Rage at a miniumum? I got the life leech nodes and the Oaks regen node already, do i need sumthin else to sustain it ? By WED he means the "increased elemental damage with weapons" roll. The flat ele rolls on quivers are kinda too low to be much good. For blood rage you need master of the arena, the one below it, and heart of oak. With that you will have a degen of 0.4%, which is unnoticeable, especially with life leech. This is a great resource for everyone who wants to get into bows, thanks for taking your time and doing this! I've learned alot about archers, a part of the game i was rather inexperienced with, by randomly stumbling across and reading your posts in the past, and it's good to see there's now a place to find all this knowledge compiled. I totally agree with you about the tooltip whoring, millions of tooltip DPS under thousands of conditional buffs you can't keep up when it matters the most are really meaningless when the build simply feels bad to play. To anyone looking for a good starter bow build that will progress with moderate investment and last you up into the toughest of content, look no further. This guy right here knows what he's talking about. So Phys to Light is better than Added Lightning? I'm kind of lost, are you planning on taking VP endgame? Why don't increase attack speed as well? Wouldn't firing more arrows per second mean more critical strikes per second -> faster clear speed overall? Or by your experience it is pointless and crit alone is enough? Because of Kaom's Heart build loses so much. Golem with 30% crit and 30% acc, Vaal Haste/Grace and some other great supporting skills, can't make Blink Arrow faster with support gems, as well as something like Arctic Armour which is great as well. 500 hp worth it? Specially considering that now there is Kintsugi to help squishy EV builds. Hinekora, and passives for dodge as well. About cursing methods. Herald of ice curses enemies after you hit them with something, right? Not when they enter certain distance to character. Isn't it kind of not so great? Poacher's Mark is most useful for flasks dependent (more or less all builds depend on flasks but I mean ones that not invest much into them and can handle everything without them) builds, right? Because I love my Projectile Weakness and it's multiplicative more damage modifer along with extra pierce chance. Can't substitute Assassin's Mark with anything though. Pathfinder drug/flask addict rules yeah!